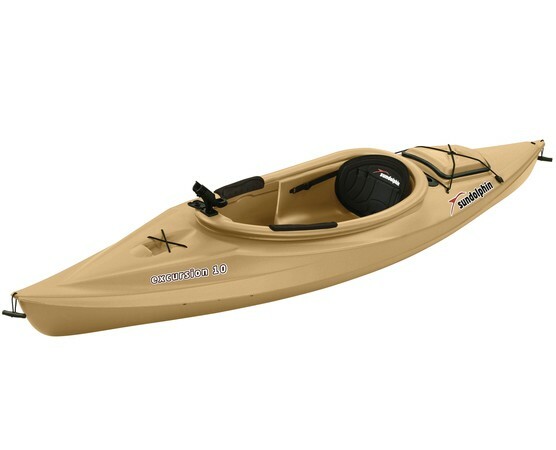 There are a lot of fishing kayaks available on the market that are brimming with the latest gear, gadgets and features. While these kayaks are great for experienced anglers who want to be absolutely prepared for anything, they can be overkill for novice anglers who are just starting out. Of course, being a novice doesn’t mean you have to skimp on quality, which is why the Sun Dolphin Excursion 10 is a good starting point. These kayaks tend to sell for less than $400 and they are great if you just want to get out in the water for some fishing. The Excursion 10 is 10’ in length and 30” wide with a weight of 41 lbs, so it can easily be carried by one person. This also means that you don’t need any help loading it up or a boat ramp to launch it. The Excursion 10 is ideally suited for fishing on lakes and rivers, although some anglers also report taking it on ocean bays and coves or other areas without any waves. Having said that, this kayak is quite stable and allows you to reel in your catch without the risk of tipping. Its tracking is generally acceptable for the purpose of fishing, but not really exceptional. Despite its compact size this kayak offers plenty of space in its large, open cockpit. For added comfort, it also features adjustable foot braces and protective thigh pads. The seat found in the Excursion 10 is padded as well as adjustable, but definitely not as comfortable as the type of seats found on high-end, sit-on-top kayaks. While the price of this kayak might raise some concerns about its quality, it actually features a rugged UV-stabilized Fortiflex high density polyethylene hull design. You can obviously find more durable kayaks, but the Excursion 10 can easily handle the elements and some wear and tear without falling apart. While the Excursion 10 is great for just paddling around and having fun, it is also quite nifty when it comes to fishing. It has one swivel rod holder, which is a nice touch and not something that is always included with cheaper kayaks. In addition, it has two flush mount rod holders behind the cockpit. In the rear of the kayak you’ll also find a handy storage compartment. While it doesn’t offer as much storage as what can be found on larger and more expensive kayaks, it does allow you to take along some essentials. Other features worth mentioning is the water bottle holder and shock cord deck rigging of the Excursion 10. The Sun Dolphin Excursion 10 offers a lot of value for money, so if you are a newcomer to the hobby who don’t want to burn a lot of cash on an expensive kayak then this one is worth a second look. It might not be as exciting as some of the bigger players on the market, but at this price point there is little to complain about in terms of features. Select the types of water this kayak is used on. Select how many times you have used this kayak. Please describe any modifications you have done to your kayak. Tell us what you think the pros of this kayak are. Tell us what the cons of this kayak are. Nothing like a good variety. "Got my board and it was in great shape. but after one use it had cracks on the hall. took some time to get it..."
"An excellent kayak that is a pleasure to fish from . I can pedal in 12-13 inches of water and not worry about the prop..."
Old Town "Vapor 12 Angler"
"I'm pleased with this boat, I think maybe I would be even happier with the 12 footer but I'm good with this one. ..."
"A great value for a basic entry level fishing kayak"
"Got this kayak as a birthday gift in September. It's my first kayak but I'm not unfamiliar with using kayaks. This has been my "dream..."